What's new in my tokusatsu pages? Created a Janperson gallery and story page in the gallery section. Check it out to know more about this MEtal Hero from the early 90's! Created a new page dedicated to a few video game original metal heroes. This page is the first step to serious update of the gallery section. Many thanks to Tenchi Masaki for the story and the pictures! 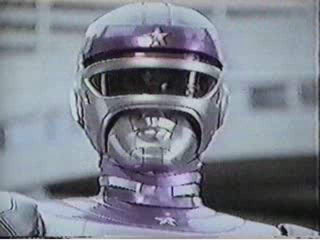 Unlike some other metal heroes that are either humans or robots with an alternate robot/human appearance, Janperson is a scientifically created robot, and only has a robot appearance. 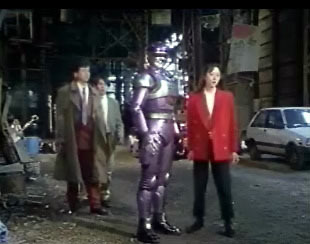 It seems that Special Investigator Robo Janperson was created as a remake of the earlier show "Robot Detective K". Both plot a robot detective engaged in a battle against an evil group, but as Robot Detective K is apparently older than the first Metal Hero show, and by many aspects doesn't actually fit the genre anyway, i think that Janperson just caught up with the Metal Heroes trend as a way of brushing up the robot investigator concept. 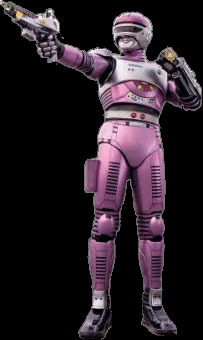 Interestingly enough, Janperson came a few years after Mobile Detective Jiban, which also features a robot detective; but there's apparently no connection between the latter and either Robot Detective K or Janperson. In a distant future, scientists try creating a robot with human appearence that can destroy the many criminals and androids involved in evil activities. The robot MX-A1 arise from that project, it is designed to face either human or android ennemies. Everything was going perfectly until the day when, facing a set of tests against firearms and androids in order to improve it's attack and defense power, MX-A1 not only destroy the assigned targets but also turns back to it's creators and attack them. After a fierce struggle against the mad robot, the scientists finally manage to deactivate the MX-A1. As the machine failed in his initial "Protect The Human Being" purpose, the project is abandonned. However, the young female scientist Kaoru Saeguchi decides to collect the parts of MX-A1 and secretly transport them to a hidden base. As a Police scientist, Kaoru engages in creating a new and powerful justice fighter from the remains of the MX-A1. The "Robotic Detective Jumperson" was born, with the mission of fighting the crime, protecting humans and androids from evil scientists and robots. Janperson usually appears with a smoked screen that cover most of his "face" (his robotic face, that is). 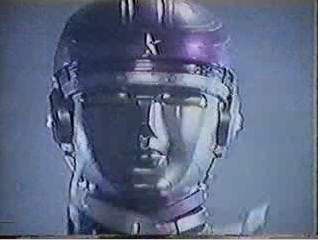 Take the shield off, and you'll see a weird metallic face that is very distinctive to japanese fiction robots, to me. 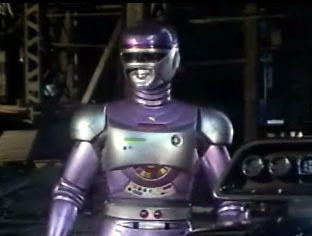 Janperson, smoked screen version actually looks like a regular Metal Hero, but the humanoid face makes it closer to "Robot Detective K". The "naive" feel of that face, and the fact that it somehow resembles a greek statue bring me back to the "super robots" era, in the 70's and early 80's, when several of the colorful giant robots that were the trend back then had this kind of static face imbedded in their robotic head. I couldn't say for sure what's the idea behing that design, that captivates me, but i've always been interested in this japanese tradition to include a greek-statue-like face in fantasy high-tech SF robots. As a matter of fact, it's also interesting to notice that no real robot is given such a face; since most of the real industrial robot projects are designed with human interaction and social acceptance in mind,. This would emphasis the fact that the greek statue face refeers to a mythological fascination idea, something close to the golem myth. Nobody would ever want to have a golem at home, i guess; but picturing one in a SF show brings an interesting twist to the robot approach. 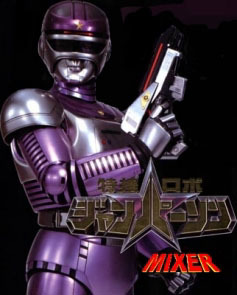 As every metal hero, Janperson comes with his share of high-tech equipment including weaponry and vehicles. His car, named "Dark Jaycar" (there again, as Robot Detective K's car is named "Joker", one can think of a reference) contains a detachable helicopter called "Sky Jaycar". The Dark Jaycar and the Sky Jaycar have a maximum speed of respectively 700 km/h and 1800km/h. High-tech, that certainly is! As for the arsenal, the car is equiped with a cannon called Land Jaycar. Hand weapons include the laser gun Jande Thingy (firing rate of 95 shots per second), and a mini robot called All Zico can combine with the Jande Thingy Gun to form the powerful Thingy Cannon. 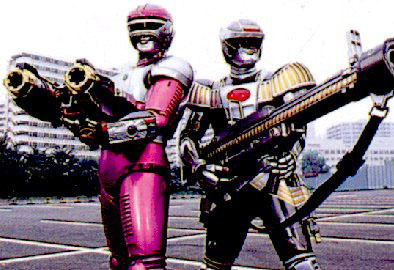 Right : I've never seen the show but i guess this should be the Jande Thingy gun that Janperson is proudly holding. 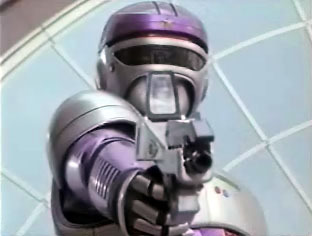 At some point of the series, Janperson has to face the robot Gungibson (right on the picture), created by the criminal group Super Guild in order to destroy Janperson. But after Janperson eventually saves him, Gungibson changes side and turns into a justice fighter. Gungibson is equipped with a motorbike named "Go Slayer", the laser gun "Bronson" and the "GunVovler" revolver. "Ok baby!" is one of his recurrent quotes. - the SS-N (Super Sciense Network) organized by the diabolic "Reiko Ayanokouji"
- The Consuelon Tatewaki that is commanded by the president "Ryuzaburou Tatewaki"
Update! I've received additionnal informations on the show from Tsubasa, from Japan. He gave me a few correction to the information above, and he also gave me interesting information about the actors. President Ryuzaburou Tatewaki is played by Syun Sugata. Shun Sugata appears in such films as "the Last Samurai", or Tarantino's "KILL BILL". George Makabe is played Kazuoki Takahashi, who also played as "Syo Hayate/Change-Griffin" in the Super Sentai show "Lightning Team Changemen (Dengeki-sentai Changemen)"; and also played the "Hakkou Kita" character in the Metal Hero show "Supermachine Metalder (Choujinki Metalder)" under the actor's name Hiroshi Kawai. Reiko Ayanokouji is acted by Atsuko Takahata, who is a famous and popular actress in Japan.